The content in this knowledge base is based upon the standard FACULTY180 environment. Your institution may have made changes to configure the FACULTY180 environment to meet your institution's needs; therefore the screens in your FACULTY180 environment may differ slightly from the knowledge base. For more information, please contact your FACULTY180 administrator. 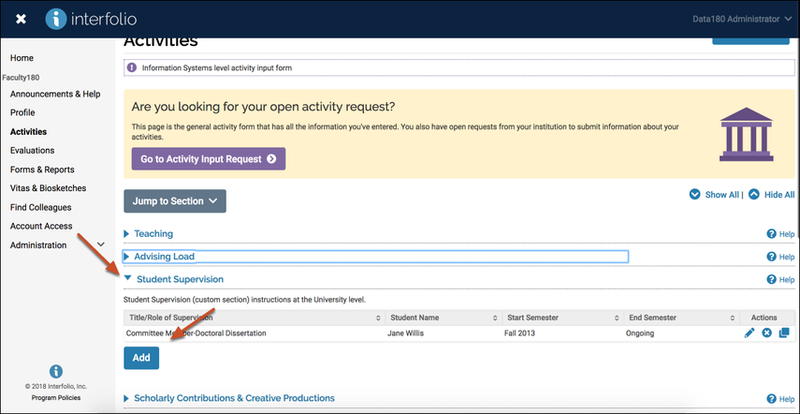 Faculty members can update most of their activity information at any time (the Teaching and Advising Load sections can only be completed during the active activity input period). In addition, faculty members are reminded on a regular basis by their institution to review and submit their activity information so it remains current. Reminders that the Activity Input Form needs to be reviewed and submitted display in the To Do section on the Dashboard. Some institutions also choose to notify faculty members by e-mail that the Activity Input Form needs to be reviewed and submitted by the faculty member. You also have the option of editing, deleting, and cloning existing entries. If an activity is edited after an activity input form has been submitted for review, an updated activity input form can be submitted if the previously submitted activity input form has not yet been approved -- the updated activity input form must be submitted on the Forms & Reports screen. The updated Activities page, displayed below guides you to any open activity input requests you may have open. Your ability to edit and add information may be restricted or structured by your institution or department. If you have any questions, please reach out to your FACULTY180 administrator at your institution. Click Activities on the navigation bar. The activities page will display. Click on the section headers to expand the collapsed sections, or the navigation button to jump to the relevant headers. To add a new entry to a section, click Add in the desired section, complete the necessary fields, then save the information. The section labels and heading are specified by your institution. If you have any questions regarding the contents of each section, please reach out to the FACULTY180 administrator at your institution. Depending on your institution, faculty members are able to view their teaching summaries outside of the current academic term. Contact your FACULTY180 administrator at your institution for more information. The Teaching section in the Activity Input Form displays a list of the courses that are currently assigned to the faculty member for the current academic term, along with any corresponding course attachments (e.g. syllabus, course, and peer evaluations, etc.) and the faculty members teaching load. Faculty members are responsible for verifying that the course information and related course information are accurate for each academic term. In some cases, multiple course sections may need to be grouped together, as these sections might represent the same course. The course information displayed in the Teaching section was previously uploaded from your academic institutions ERP (Enterprise Resource Planning) system. If any courses are missing, please contact your administrator. In Section A, select the check boxes in the Group Courses column adjacent to the course sections you wish to group together. Click the Group button. The selected course sections are now grouped together and display in a single row. If the Credit Hours and/or Teaching Load are incorrect, enter the correct information in the desired field(s). The totals at the bottom are updated automatically. If you are not teaching a course section that is displayed on the Activity Input Form, select the check box in the Course Not Taught column adjacent to the desired course section. The course section is grayed out, and the Credit Hours and Teaching Load are automatically updated to reflect the change. Course attachments, such as a course syllabus, course evaluations, and peer evaluations can easily be added to a course in FACULTY180. In Section B Course Attachments, click Add adjacent to the course section that you wish to add an attachment to. The Course Attachments dialog box opens. Click the Browse button, select the desired file to be uploaded, then click Open . The selected file name displays. Click the Type drop-down arrow, then select the type of course attachment being uploaded. If the Othertype is selected, specify the type of file in the text field that displays. If multiple course selections are available for the same course, each course section will be listed. Select the check boxes adjacent to the course sections that you wish to upload the attachment to. When you are finished, click the Upload button. The courses attachment is added to the selected course. To delete a course attachment, click the attachment type you wish to delete for the desired course, click the Delete icon, then click Delete. The course attachment is removed. 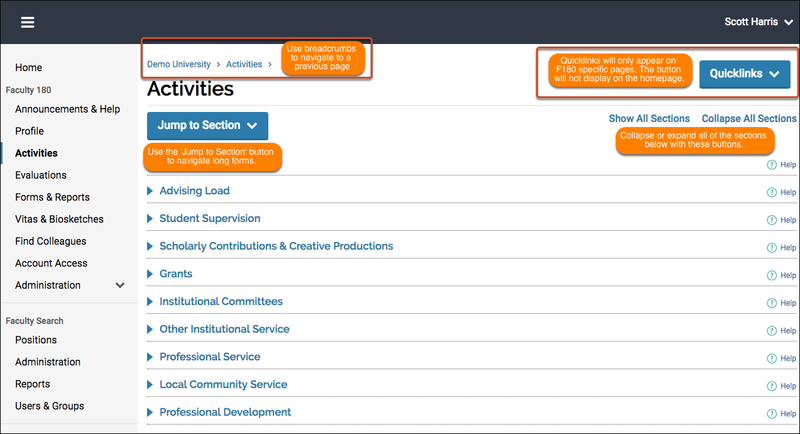 The Advising Load section is used to specify the number of individuals you are advising at the undergraduate, masters, and doctoral levels. To update the information, simply click the desired field and enter the correct information. The total is updated automatically. The Student Supervision section is used to manage information for all students you are supervising or have supervised previously. To add a new student, click Add, complete the necessary fields, then save the information. You also have the option of editing, deleting, and cloning existing student supervision entries. The Scholarly Contributions & Creative Productions section is used to view and enter activities relating to scholarly or professional works (e.g., journal articles, books, proceedings) and creative works (e.g., performances, exhibitions) that you are participating in or have completed. Related attachments for an activity can be viewed by clicking the corresponding link in the Type column. The Grants section is used to add pending grant-related projects, proposals, awards, and renewals. Funding amounts should also be updated to reflect ongoing changes and maintain a complete history of the project throughout its completion. Funding dates can be recalculated based upon the start date and grant periods. The Institutional Committees section is used to add any formal standing committee appointments you may have within the academic institution. Do not list ad hoc committees, dissertation/thesis committees or informal assignments in this section. These types of entries should be listed in the Other Institutional Service section. The Other Institutional Service section is used to add any services you have performed for your academic institution other than formal standing committees. This could include ad hoc committee, dissertation/thesis committee, course development, faculty sponsor to a student organization, web page design, student recruitment activity, informal assignments, and non-research grants. The Professional Service section is used to add any services you have rendered for an academic or professional organization. This could include committee appointments; journal editor or reviewer; a speech or presentation of a non-research paper at a professional meeting; or moderator, discussant, or panelist at a conference. The Community Service section is used to add any volunteer community service you have performed. The community service does not have to relate to the education profession. The Professional Development section is used to add any conferences, training, continuing professional education, etc. in which you participated. Do not list degrees in progress in this section degrees should be entered in the Profile Form. The Consulting section is used to add any paid/unpaid consulting engagements that require professional expertise in support of a client, such as reviewing textbooks and textbook proposals. The Other section is used to add other service contributions that are not included in other sections of the Activity Input Form.